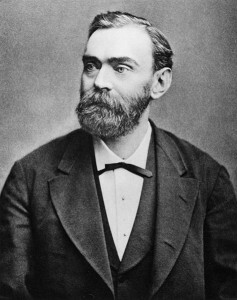 Alfred Nobel was born in Stockholm, Sweden, in 1833. In 1842, the Nobel family moved to Russia, where Alfred and his brothers received an education in the humanities and the natural sciences from private tutors. Nobel is accredited with the invention of dynamite in 1866. Dynamite and the blasting cap are two of Nobel’s most well known inventions, and he held 355 patents. Second to his reputation as an inventor is Nobel’s reputation as a businessman; he established businesses and laboratories in over twenty countries. Nobel was not only interested in the sciences but he seriously considered becoming a writer, choosing to write poetry, drama, and even an unfinished novel in his leisure time. Nobel sought conciseness in language, and he was a gifted writer of aphorisms. On November 27, 1895, Alfred Nobel signed his final will and testament. In his will, Nobel established the Nobel Foundation, which awards prizes in Physics, Peace, Literature, Chemistry, and Physiology or Medicine. Nobel was explicit in his instructions that the prize should go to the person or persons who made the greatest contribution to mankind through their field, regardless of nationality. Nobel died of a heart attack in San Remo, Italy on December 10, 1896, just over a year after signing his will. The first Nobel Prize was awarded in 1901. In 1968, the Bank of Sweden created the “Bank of Sweden Prize in Economic Sciences in Memory of Alfred Nobel,” sometimes referred to as the Nobel Prize in Economics. King Gustaf III founded the Swedish Academy on April 5th, 1786. It is very similar to the French Academy. In his inaugural speech upon the formation of the Swedish Academy, Gustaf III announced its main purpose to preserve the ‘purity, vigour and majesty’ of the Swedish language. To accomplish its goal, the Academy was charged with the production of a Swedish dictionary and rules regarding not only grammar, but proper behavior as well. Gustaf III created the Academy to serve a patriotic purpose as well, each year commemorating one Swede of remarkable achievement. At the turn of the twentieth century, the Academy assumed the task of awarding the Nobel Prize in Literature, which was not a part of its original statutes. Every year the Swedish Academy sends requests for nominations of candidates for the Nobel Prize in Literature. Members of the Academy, members of academies and societies of similar membership and goals, professors of literature and language, former Nobel laureates in literature, and the presidents of writers’ organizations representing their countries’ literary productions are allowed to nominate a candidate. It is not possible to nominate oneself. Thousands of requests are sent out each year, and about fifty proposals are made. A proposal does not need to be accompanied by supporting reasons, but it can be. Proposals must be received by the academy by February 1st, and the proposals are examined by the Nobel Committee throughout the spring. By April, the Academy narrows the field to around twenty candidates, and by summer the list is usually reduced to five names. In October, the members of the Academy vote, and the candidate who gains more than half the number of votes is named the Nobel Laureate in Literature. In Stockholm on December 10, His Majesty the King awards the prizes during the Prize Award Ceremony. The Peace Prize is awarded on the same day in Oslo by the Chairman of the Norwegian Nobel Committee in the presence of the King of Norway. The winner of the Nobel Prize in his or her field receives a diploma, a medal, and a document certifying the prize amount. The prize amount is the same for every field. It can be awarded to one person or team, split between two or three individuals, or allocated to the Main fund or Special fund for that field. The institution that awards the prize in a given field determines the design of the diploma for that field. The Royal Swedish Academy of Sciences awards the prizes in Physics, Chemistry, and Economics. The Nobel Assembly at the Karolinska Institute is responsible for the Physiology or Medicine Prize, the Swedish Academy for the Prize in Literature, and the Norwegian Nobel Committee for presentation of the Peace Prize. The diplomas have varied over the years, depending on the field and the artist. Today, each diploma is a unique creation. The Nobel medals each bear on one side a portrait of Alfred Nobel. The other side bears an inscription and an image appropriate to the laureate’s field. The designs of the medals have remained unchanged since 1902. Until 1980, the medals were made of 23 karat gold. Since then, they have been made of 18 karat green gold plated with 24 karat gold. In addition to the diploma, medal, and prize amount, every Nobel laureate since 1961 has been commemorated with an annual series of stamps issued by the Sweden Post Stamps. 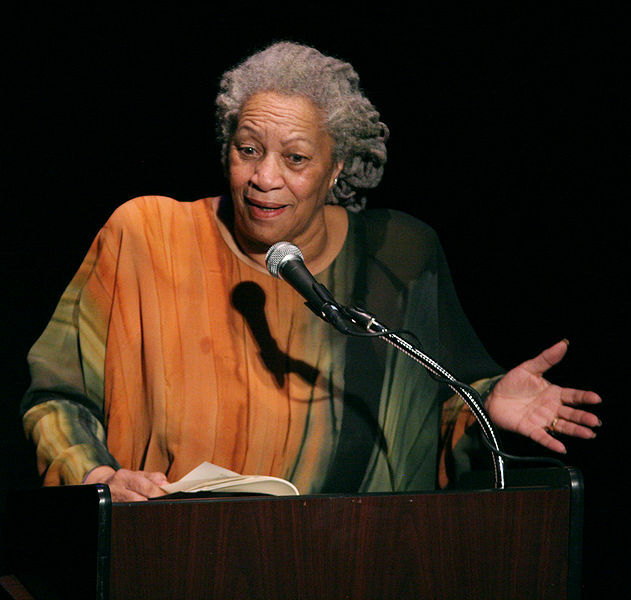 Since the establishment of the Nobel prize in literature, it has been surrounded by a great deal of controversy. In his will, Nobel was clear that the prize was to be given to the author of “the most astounding work in an ideal direction.” There has been much debate as to what, exactly, Nobel meant in this statement. What constitutes an “astounding” work is highly subjective, as is the vague requirement that the work move “in an ideal direction.” It is this last ambiguity that has been the source of much debate over the years. Some people have argued that Nobel meant idealistic, and not ideal, which is an entirely different concept. As Kjell Espmark writes, “Indeed, the history of the literature prize is in some ways a series of attempts to interpret an imprecisely worded will.” The selection of the first Nobel laureate in literature, Sully Prudhomme, was attacked by August Strindberg in 1910. Strindberg argued that Prudhomme’s writing was not written ideally because “he was a materialist and had translated Lucretius” (Allen). The Swedish Academy. “Swedish Academy (English)” (Dec, 2000) Web. 31 October 2001.